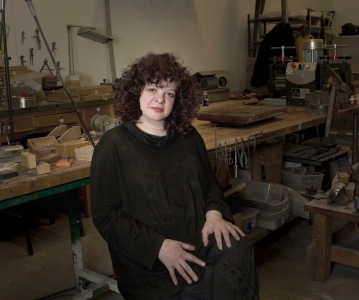 Lisa Gralnick was born in New York in 1956, and received an MFA degree in Metalsmithing from SUNY at New Paltz in 1980 under Professors Kurt Matzdorf and Robert Ebendorf. Her father was a dentist and her mother was a nurse, and, although there were no artists in the family, she was exposed to art at a very young age and attributes her analytical mind and precise mechanical skills to her father. As a young girl, she played the violin, and thought perhaps that she would pursue a career in music but unexpectedly decided to major in art in college after taking a metals class at a local art center while still in high school. After completing her graduate degree, she taught at Kent State University and then Nova Scotia College of Art and Design before settling in New York City in 1982 to pursue her career as an artist full-time. In 1991, she accepted a position as Head of the Jewelry and Metals program at Parsons School of Design, a position she held until 2001 when she moved to Madison, Wisconsin to begin a position at the university. She is currently Professor of Art at the University of Wisconsin-Madison. Gralnick has had a career as an artist that has spanned more than three decades, and she has received numerous awards, grants and fellowships for her work. These include four fellowships from the New York Foundation for the Arts, a Louis Comfort Tiffany Foundation Grant, a Wisconsin Arts Board Grant, and two fellowships from the National Endowment for the Arts. She has also been awarded prestigious research grants from the University of Wisconsin-Madison, including the Vilas Associates Award and the Kellett Mid-Career Award. Additionally, she recently completed an oral history for the Archives of American Art of the Smithsonian Institution. Gralnick’s works have been exhibited both nationally and internationally in such places as New York, Boston, Los Angeles, Tokyo, London, Munich, Amsterdam, Oslo, Australia, Spain, Korea, and the Czech Republic. Her artworks have been acquired by distinguished museums throughout the United States and abroad. These include the Metropolitan Museum of Art in New York, the Museum of Arts and Design in New York, the Boston Museum of Fine Arts, the Philadelphia Museum of Art, the Houston Museum of Fine Art, The Renwick Gallery of the Smithsonian , and the Stedelijk Museum in Amsterdam. Her works are also included in the collections of the Chazen Museum at the University of Wisconsin-Madison, the Mint Museum, the Racine Art Museum and the Arkansas Art Center. Gralnick recently completed a seven year project in three parts, titled The Gold Standard, which was exhibited as a solo exhibition at the Bellevue Arts Museum and was accompanied by an 82 page catalog. Other recent exhibitions include the Tool at Hand at the Milwaukee Art Museum, Schmuck 2012 at the Handwerkmesse in Munich and Ashbutan as part of the World Craft Conference in New Delhi, India.